Print, Design, Marketing, Digital, Mailings, Signs, Displays, Delivery and so much more. Your only stop for implementing your marketing plans, keeping an efficient office, and growing your business. Under new ownership, Sumit Vasishtha and his professional, creative staff can help you with your design and print needs, taking your ideas and creating them on paper or into digital media. Nobody takes care of your business and personal needs like the KKP Team. 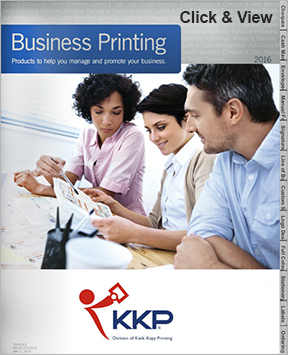 KKP can service your printing needs from black ink to multi-colour printing on a variety of different weights, colours and finishes in paper, including large format printing up to 42 inches wide. Print-on-demand pieces can be produced quickly on their in-house digital equipment, with crisp images, fine detail and high resolution - every time. Adding full colour will enhance anything from presentations to important marketing and sales materials. They can also custom finish your order by cutting, folding, collating, laminating, binding, custom index tabs and more. Ask about Variable Data Printing, perfect for one-to-one personalized marketing, and direct mailing services are available. Let KKP be your communication partner. We take pride in helping you look your best! At KKP we are committed to providing solutions that meet your needs, by combining quality, service and technology. Care and detail goes into every job that you bring to KKP. Please feel free to call us at 519.621.1991 if you have any specific queries or requirements. Or email us at orders@cambridge.kkpcanada.ca or visit our website www.cambridge.kkpcanada.ca where you can send us files and orders online. We look forward to earning your business and working with you very soon.